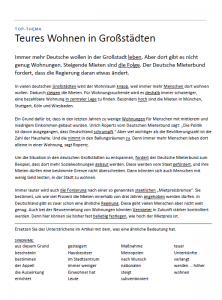 Here are additional materials and activities I have created for teaching Deutsche Welle’s Top-Thema module entitled “Teures Wohnen in Großstädten“. The original Deutsche Welle materials can be accessed from the theme webpage, or the text and exercises (pdf) and audio (mp3) can be downloaded for offline use. In the post Teaching with Deutsche Welle’s Top-Thema and Video Thema, I outline how I use these Deutsche Welle modules in an intermediate- to advanced-level courses with varied goals. Visit that page to see how my students begin to work with the materials Deutsche Welle provides. Here I am offering and explaining the extension activities that I use (before and) after we have exhausted all of the excellent materials Deutsche Welle provides to accompany the text. Downloads of all exercises described here are linked at the bottom of the page. In vielen deutschen Großstädten wird der Wohnraum knapp, weil immer mehr Menschen dort wohnen wollen. In vielen deutschen Metropolen wird der Wohnraum beschränkt, weil immer mehr Leute dort wohnen wollen. To complete the activity, students need to pay attention both to form and to meaning in context. Having them work in pairs is useful because they can learn from each other and fill in each other’s knowledge gaps. In the end, students will have essentially rewritten the text using other words and phrases. I created a list of some of the words and concepts out of the text that are central to understanding the gist of the article. In small groups, students attempt to clarify and explain what the concepts mean. This helps them hone in on the main issues in the text and helps prepare them for further discussion of the rising cost of living in cities and associated issues. I emphasize, as always with in-class work on language meaning, that students should be speaking and not sitting silently and writing. I feel that students ought to take advantage of the classroom environment where they readily have German-speaking conversational partners to practice their speaking skills. I also point out that they have much to learn from one another. Students explore the content further using a set of content and discussion questions I put together. Some of the questions ask them to further clarify the information in the article. Some of them ask students to share their own experiences, ideas, and opinions. After they discuss their ideas in small groups, we talk about some of the issues as a class. It is always advisable when using some of the archived Top-Thema materials to check the latest information on the chosen topic. Between the time when this article was published and the time we covered it in class, the German government had indeeed passed a so-called “Mietpreisbremse” regulation. It had not yet gone into effect, but was scheduled to do so at the beginning of the next calendar year. Informing myself about the issue gave me the chance to address students’ questions about how such a regulation would work, how it would affect landlords and renters, and what provisions exist within the law to define where it is implemented, what conditions have to be met, who is exempt, etc. One of the handful of resources I consulted and found useful was this FAQ page from Tagesschau. If students in the course are at mixed levels, you could have the more advance students prepare for class by reading the FAQs or some other resource and being the “content experts” responsible for explaning the concept and addressing any questions. 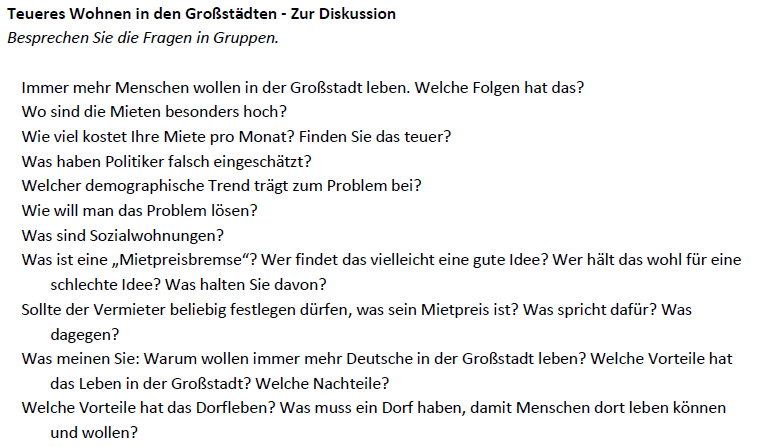 The topics on these cards include themes touched upon in the text or in some way tangentially related — for example, warum Mieten steigen, warum man auf dem Land wohnen will, was man nachts in der Großstadt tun kann — but others go beyond the theme: große Meilensteine des Lebens, was man in einem Museum sieht, and was man macht, wenn man zu Hause ist. This set of Was passt? flashcards can be used in at least two different ways. In both variations students work in small groups. (1) Intermediate: Association game. Students choose a card and attempt to collectively name as many things as they can that fit the category on the card. For example, if students collect the card that reads warum Mieten steigen, they might say things like Zu viele Menschen ziehen in die Stadt. Es gibt nicht genug Wohnungen. Immer mehr Menschen wollen alleine leben und die Zahl der Haushalte steigt. Vermieter dürfen Mieten fast beliebig festlegen. When students feel like they have exhausted a topic, they move on to the next card. If you want to make a real “game” out of it, then the person who offers the most associations or the last association gets to keep the card. Whoever has the most cards at the end of the pile or at the end of a predetermined time wins. (2) Advanced: Category game. If an association-type game seems too easy for your students, then try this more challenging variation. One student (or two, especially if the course has mixed levels) chooses a card from the pile, ensuring that others cannot see what is on it. The student tries to get others in his/her group to guess what is on the card by giving examples of things that fit the given category. So using the card given as the example above — warum Mieten steigen — the student would say things like: Zu viele Menschen ziehen in die Stadt. Es gibt nicht genug Wohnungen. Immer mehr Menschen wollen alleine leben und die Zahl der Haushalte steigt. Vermieter dürfen fast beliebig festlegen, wie viel Mieter zahlen. The other students in his/her group try to guess what is written on the card based on the clues. If I think students will have a hard time understanding the concept of the game, I like to show them a YouTube clip like this one from the old TV game show “$100,000 Pyramid” because that game works in much the same way. Within 30 seconds of watching the clip, students understand how to mimic what is done on that show using the flashcards. And the original Deutsche Welle Top-Thema page in HTML, with audio and comprehension exercises, is here:”Teures Wohnen in Großstädten“.